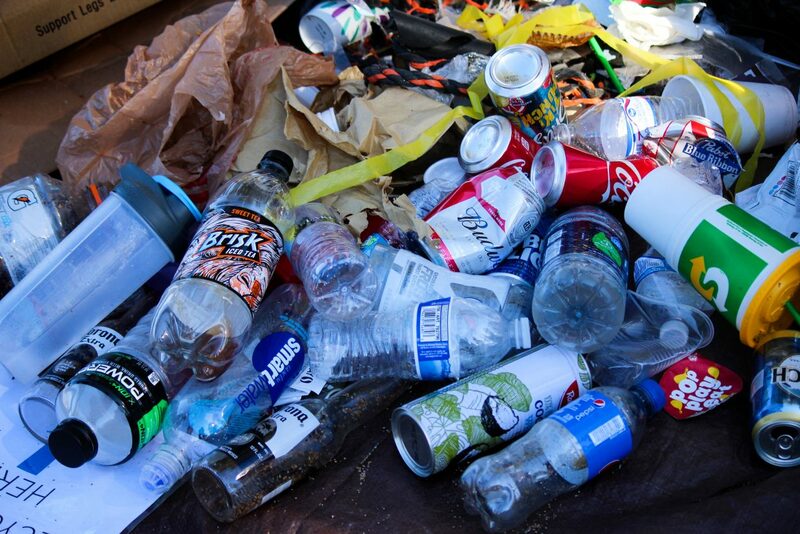 Despite the alcohol ban at many beaches, beer bottles and cans were common among the recyclables collected. Stateline residents Anne Marie Rose and Vicki Schussel were among the volunteers at Nevada Beach. A volunteer puts on gloves before going to collect trash. Once the trash is collected, it is weighed and sorted by volunteers. 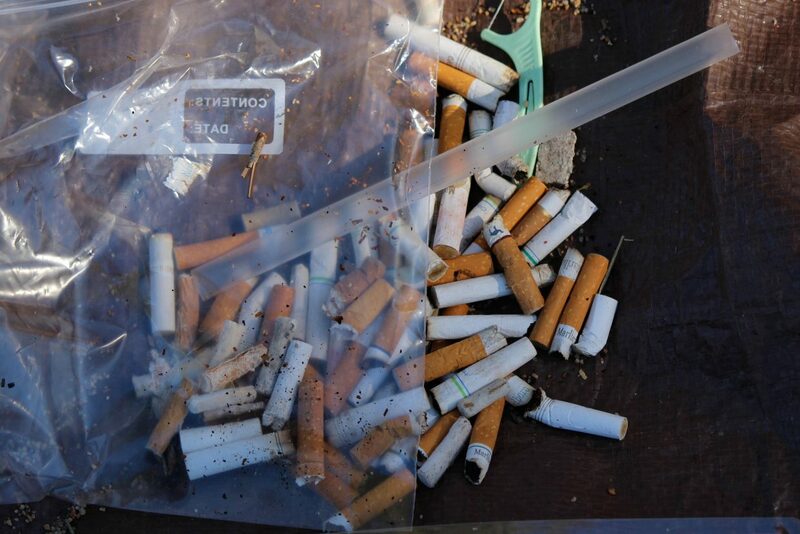 Cigarette butts are one of the most common items found, and can contain toxins like heavy metals. One volunteer found a box with half a pizza still in it. Luckily it hadn’t been discovered by wildlife before being found. Volunteers arrived at Nevada Beach at about 8:30 a.m. to beat the beach rush. 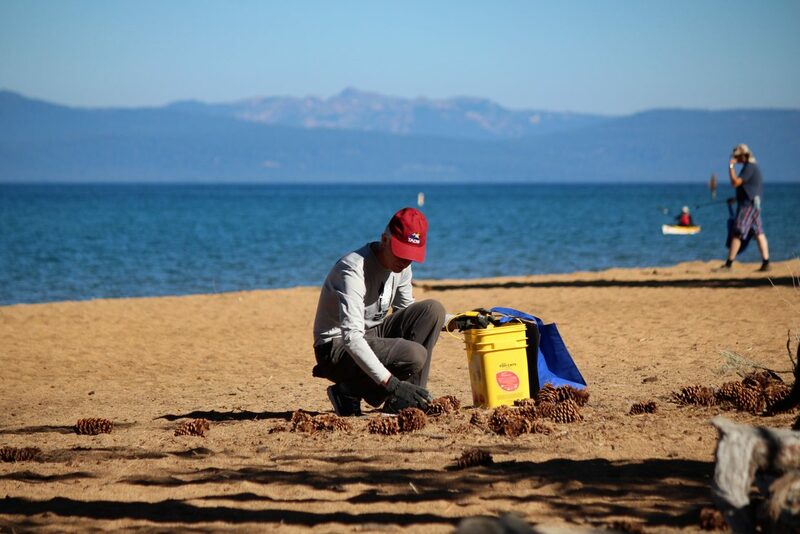 After yesterday’s Fourth of July festivities left mounds of cans, bottles, cigarette butts and plastic on Tahoe’s shorelines, hundreds of volunteers gathered at five beaches for the League to Save Lake Tahoe’s annual July 5 beach cleanup. 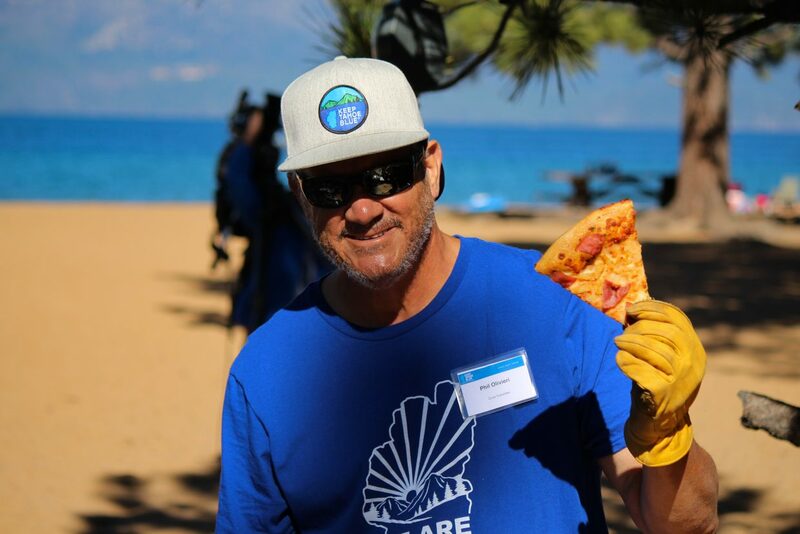 “Anyone want pizza?” said one of the League to Save Lake Tahoe’s core volunteers, holding up a pizza box with half an unfinished pie, which had been abandoned on the beach sometime yesterday. About 500 people turned out to volunteer for this year’s cleanup. 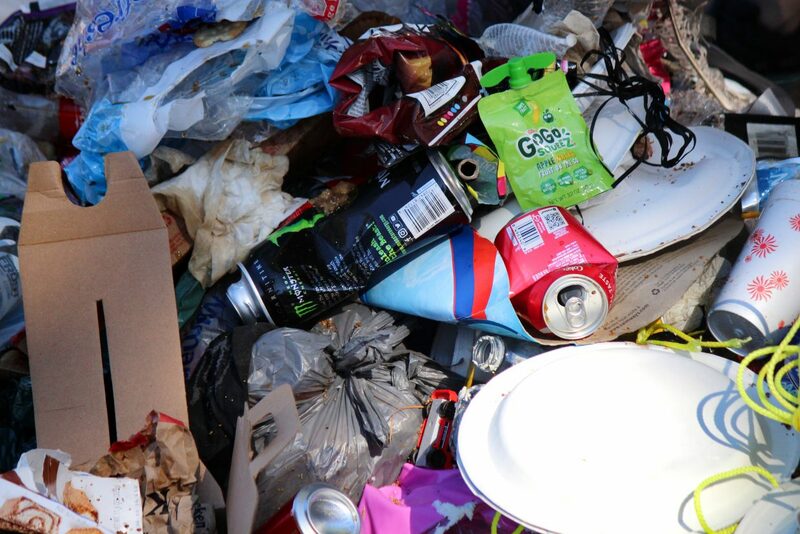 Last year, volunteers collected more than 4,000 pounds of trash. This year’s efforts yielded about 1,500 pounds between Reagan, Nevada and Kiva Beaches in South Shore. The League’s Community Engagement Manager Marilee Movius said it’s important that people take ownership for trash left behind. 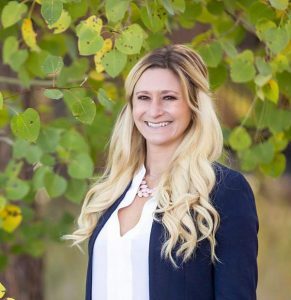 She emphasized the importance of volunteering at times when staff, like those at the Lake Tahoe Basin Management Unit, can’t clean up the shorelines alone. 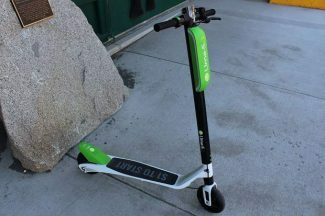 In addition to the environmental benefits, the cleanup is important for the League because it allows staff to collect data on the types of materials people are likely to leave behind and identify trash hotspots. 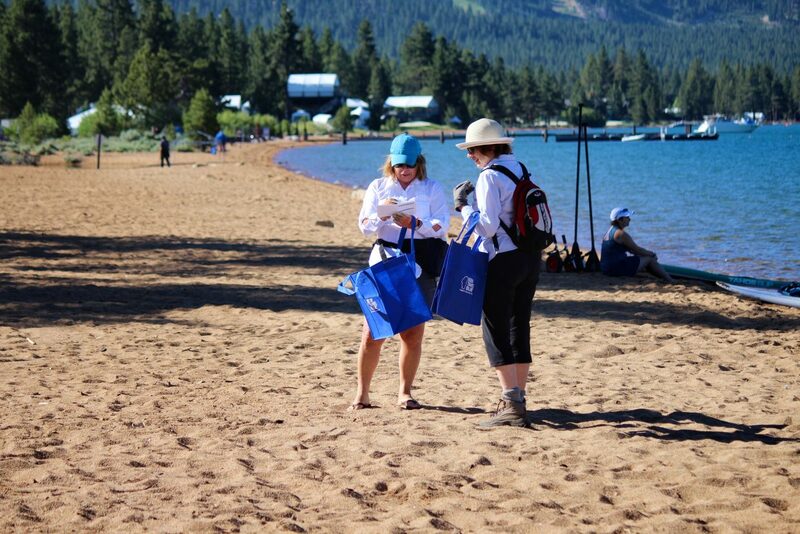 Participants are given a Keep Tahoe Blue tote bag and a log sheet to collect and identify what they find, after which they bring it to the weigh station where it is weighed and sorted by the League’s core volunteers. As a result, the League is able to collect data about which materials are likely to be left behind, broadening its understanding of how to protect the Tahoe Basin from environmental threats. Earlier this year, South Lake Tahoe city council voted to ban polystyrene, or Styrofoam, which was proposed by the League and supported with data from the cleanups. 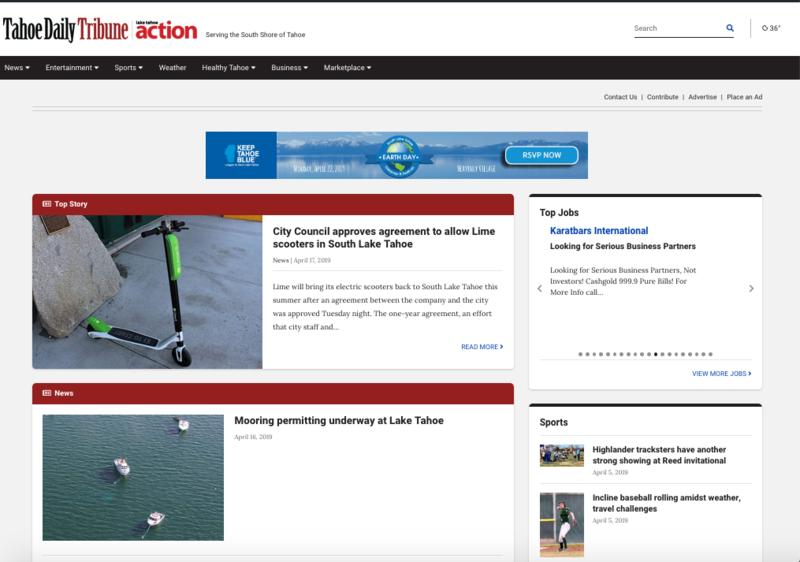 Both locals and visitors come to support the effort, and were encouraged to register online beforehand. Collins said she’s known of people taking a day trip to the lake to volunteer, even if they didn’t spend the Fourth in Tahoe. Stateline resident Anne Marie Rose said it was her first time volunteering and she was looking forward to it because she was unable to in previous years. Within half an hour of the Nevada Beach cleanup, volunteers were already sorting through a hefty pile of trash, but said they haven’t seen the same frequency of larger items like clothing, blankets and tents left behind as in previous years. Movius said the League encourages people to pick up every piece of trash, no matter how small, because they can be dangerous to wildlife. Though they are hard to spot, objects like cigarette butts and bits of plastic can be particularly harmful if ingested by animals. This year volunteers picked up 8,061 butts and 18,235 pieces of plastic. Human food, though it appears biodegradable, should be treated like any other piece of trash. 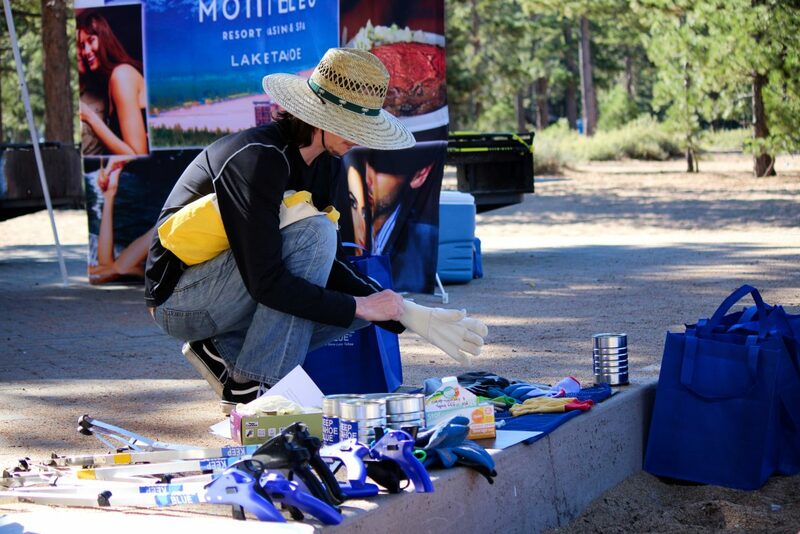 The League hosts a number of other cleanups throughout the year, which can be found on the Keep Tahoe Blue website. CORRECTION: The headline on this story has been corrected to state volunteers cleaned up about 1,500 pounds of trash. 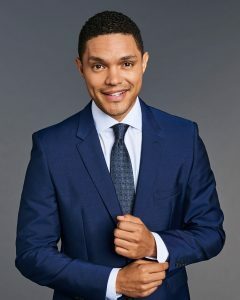 The story also has been corrected to say about 500 volunteers. The exact number was 499 volunteers.